This film made it clear how much effort and energy goes into getting something from the field to the fridge. One of the most shocking images in this film is a giant pile of bananas – all of which have been rejected due to their shape. Supermarkets have standards for how bananas must be shaped, or they won’t buy them from the farmers. This is just one of the many shocking things revealed in this film that demonstrates the scale and pointlessness of food waste. 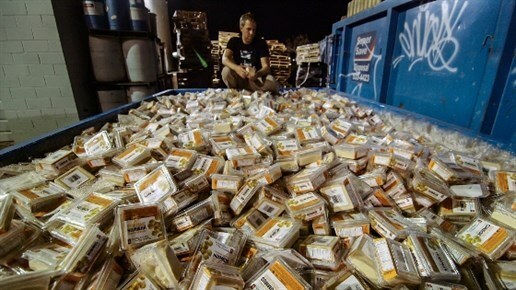 About 40% of all food that is produced ends up being thrown away. If it isn’t wasted in the field, on the way to the store, in the store, or off of our plates, then it will sit in the fridge until it’s no longer edible. While this film reminded me of Dive!, another tale of living off food found in dumpsters, Just Eat It shared some more insights into the broken food system and really made it clear how much effort and energy goes into getting something from the field to the fridge. Vancouver couple Jen and Grant decide to investigate just how much food waste is out there by challenging themselves to living on only discarded food for six months. The only exception is that if they are at someone else’s house, they will allow themselves to accept non-discarded food. Along with their personal journey into dumpsters and discards, the film features interviews with TED lecturer, author, and activist Tristram Stuart and author Jonathan Bloom. Looking at the process from how food is grown, marketed, bought, consumed, and ultimately to how so much is wasted, it presents food waste as one of our biggest problems. As Jen and Grant dive deeper into their new life of hunting for discarded food and “culls” in the grocery store, they end up eating very well and filling their stomachs and pantry to the brim. Some of the food they find isn’t even expired, and we learn that sometimes a store will throw away a whole stock of one product to either make way for a new one or just because the company has decided they will no longer sell that item. There are also some stories included about people doing their part to reduce food waste. One pig farmer in Nevada feeds his pigs scraps from the plates of Las Vegas. He has a never ending supply of food waste that his pigs love. Quest, a low income grocery store is also featured, and they sell only things that other grocery stores are getting rid of. Without this type of store all of those products would be wasted. We all need to start thinking about food waste more seriously and realize our culture of abundance translates to a culture of waste. Having just enough food at a dinner party should not be embarrassing, throwing out the leftovers should be. This film presents the issue in a highly informative, often entertaining and inspiring way, and I think most people would benefit from watching Just Eat It.